Dotty lived with Alzheimer's but still engaged in activities like coloring. Our good friend Jeannemarie came into town and she bought Dotty a coloring book, crayons, and colored pencils. I really had no idea what to expect. What happened next truly amazed me. Jeannemarie sat down with Dotty. Jeanmarie then received a call on her cell phone and left Dotty alone for a while. When she returned Dotty was coloring away on her own. When Jeannemarie saw this she ran down to our place and yelled, grab your camera and hurry. I did as requested and much to my surprise Dotty was coloring away as I arrived on the scene. Once again, and as usual, all I can say is, more there. I really didn't expect to see what I saw. Please watch the video all the way to the end for a nice surprise and laugh. Keep in mind Dotty was well into the moderate to severe stage of Alzheimer's. In spite of this she could still use her hands. This is a good example of why it is necessary to keep people living with dementia active and doing things. Keeping a person with dementia active helps raise their self esteem, and helps them to continue living their life. I had no idea that Dotty could color, sign her name, or interact in this way at that point at the time. I continue to watch this video, and always use it when I am speaking or training caregivers. Thanks to Jeannemarie for thinking of mom, and for being the catalyst to this surprising video. 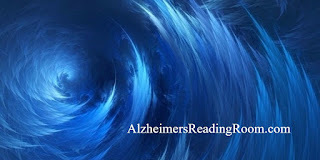 "The Alzheimer’s Reading Room is clearly one of the most informative and unbiased Alzheimer’s blogs. Bob DeMarco provides information on all things Alzheimer’s."